Karl-Anthony Towns has taken his game to an all-new level since the All-Star break. Not that he wasn’t putting up good numbers before. 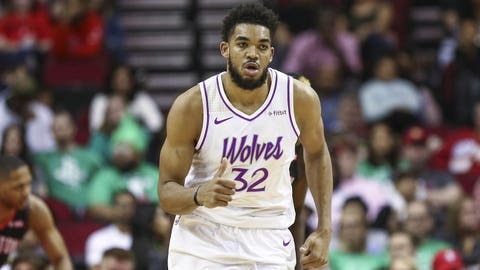 In 57 games before the break, Towns averaged 23.1 points, 12.0 rebounds and 3.2 assists per game while shooting 51.2 percent from the field and 38.9 percent from 3. Towns is actually playing slightly fewer minutes since the break — down to 32.7 per game from 33.1 — but his numbers have gone up — way up. In 10 post-break games, Towns has boosted his averages to 32.8 points, 13.1 rebounds and 3.7 assists. Aiding Towns’ scoring prowess has been his 3-point accuracy. Since the All-Star break, Towns has made 48.4 percent of his attempts from downtown. No other center (with at least 20 attempts) is even close to that percentage, with Denver’s Nikola Jocic second at 41.2 percent. Every other center is below 40 percent (Atlanta’s Alex Len is next at 38.8 percent followed by Orlando’s Nikola Vucevic, 33.3 percent, and Milwaukee’s Brook Lopez, 32.4 percent). And it’s not like Towns is cutting back on his long shots. He’s averaging 6.2 3-point attempts per game since the break, which is double his career average. Towns has made at least two 3-pointers in each of those 10 games and has a streak of 11 consecutive games with 2+ makes, which is the third-longest active streak in the NBA. The top-two active streaks will be in Minnesota on Tuesday night — Golden State’s Step Curry (46 straight games) and Klay Thompson (18). — Towns has 228 double-doubles in his first 313 career games. Since 1983-84, only three players have more over that span: Shaquille O’Neal (243), Tim Duncan (241) and David Robinson (229). — Minnesota is 6-1 in home games since Feb. 1. — The Wolves have reached 100 points in 19 consecutive games. Only Sacramento and Denver, with 20, have a longer active streak of triple-digit scoring games. — Minnesota is tied with the Nuggets for highest percentage of points coming on second chances, at 13.8 percent. — Golden State’s Kevin Durant is averaging 30.2 points per game against the Wolves. Since 2010-11, it’s the highest scoring average against Minnesota (with a minimum of 10 games played). Curry is tied for fourth on the list with 25.2 points per game.